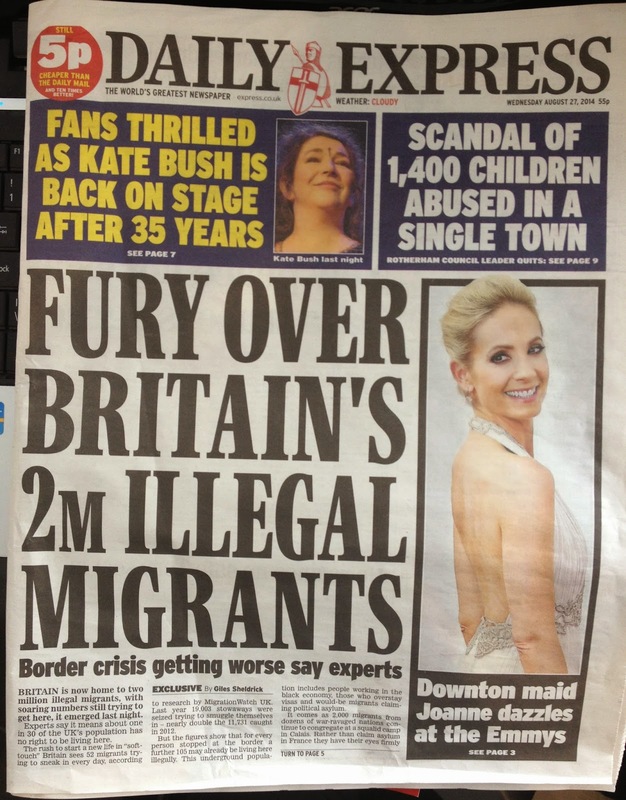 Today’s Daily Express front page headline screamed, ‘Fury over Britain’s 2m illegal migrants’. Yet, on closer scrutiny, the ‘fury’ should instead be about the Express’s careless journalism. The ‘exclusive’ statistic, claimed the Express, came from 'think tank' Migration Watch – yet Migration Watch this morning denied this, and announced that they, “declined to cooperate in this story”. In giving details about the ‘illegal migrants’ the Daily Express article referred to those “claiming political asylum” and thousands escaping from “war ravaged nations”. And yet, as the Daily Express should know, asylum seekers are not illegal immigrants. In an opinion piece alongside the Express story, UKIP leader Nigel Farage commented, “It is our fault we have created a situation that acts as a magnet to people all over the world. Our benefits system, our welfare state, is seen as a promised land…” And yet, illegal immigrants – as both the Express and Nigel Farage should know – are not entitled to any benefits. All such irresponsible journalism does is spread unnecessary alarm and xenophobia among its readers. I have already complained about similar, feckless reporting by the Daily Mail, who in the New Year falsely claimed that buses and planes from Bulgaria and Romania to the UK were full up and sold out. Again, all such inaccurate reporting achieved was to stir unnecessary fury and hatred of foreigners. 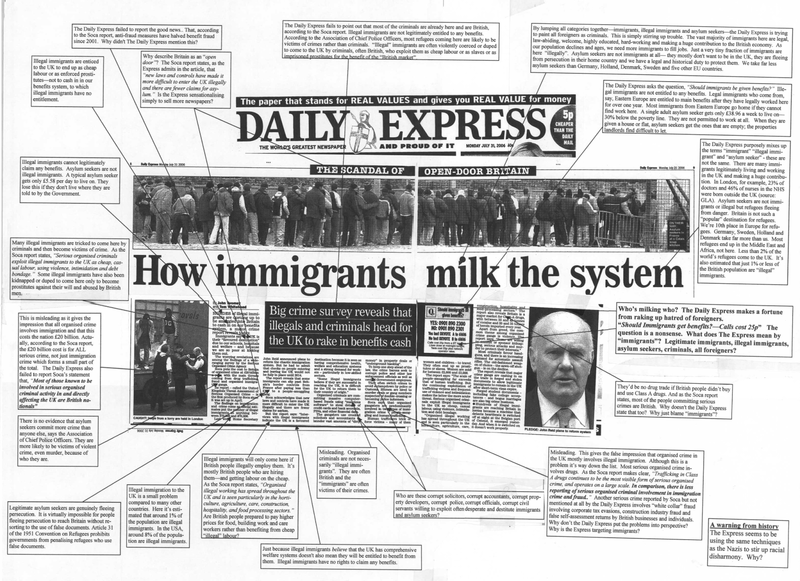 I am expecting a ruling by the Press Complaints Commission any day now..
A few years ago I prepared an analysis of a typical Daily Express anti-immigrant feature article. I see not much has changed in their editorial agenda since then. A typical Daily Express anti-immigration feature article. But how much of the story was based on truthful reporting? • How much of this Daily Express anti-migration story was true? My analysis of a typical Daily Express anti-immigration feature story. For example: By linking all categories together - immigrants, illegal immigrants and asylum seekers - the Daily Express is trying to paint all foreigners as criminals. This is simply stirring up trouble. The vast majority of immigrants here are legal, law-abiding, welcome, highly educated, hard working, and making a huge contribution to the British economy.